For some years now, I’ve been doing research on Johannes Magirus (1615-1697). He was a German physician, and by now has made me shake my head quite often because of a certain quirkyness his writings reveal. On the other hand: when not quarelling with his surroundings or boasting his genius (or then especially? ), he makes me learn quite a lot about medicine in the seventeenth century in Germany and abroad. As a student, Magirus travelled through the Netherlands, England and France. He was stunned by the practical approach of bedside teaching he witnessed there, as it was different from any medical education he had known back in Germany. After his return, he began to practise in Berlin in 1640, and afterwards moved to Zerbst (in Anhalt-Saxony). He soon left the town again, steaming with anger because of a personal enemy he named the ‘Sauffteuffel’ (booze devil). Finally, he became professor of medicine in Marburg (in Hesse) and tried to implement his experience gained abroad into his own teaching. In the announcement for his classes, he advertised to take his students to the sick whom, for demonstration purposes, he would treat for free – an early polyclinical concept largely unknown in Germany for his time. Magirus managed to reach the respectable age of 82, although he displayed a certain proneness for self-experiment. So he couldn’t help to explore the construction of a fortress while it was besieged (! ), and nearly was hit by a cannonball. In medicine, he was equally eager to gain personal experience. His special interest lay in drugs, and in particular in ‘chymical’ ones. We know this from his well-preserved medical diary and a notebook with commonplaces from his time in Berlin and Zerbst. For me, it was fascinating to see how systematical his approach was in drug-testing as a young practitioner. With each recipe he prescribed, he precisely noted its impact on the patient. With a woman in pain, he wrote in his diary: ‘after the first half of my pills, there was no bowel movement, after the second half she had a motion eight times’ or ‘before my pill, she always was in pain at two o’ clock, but afterwards at three o’ clock’. 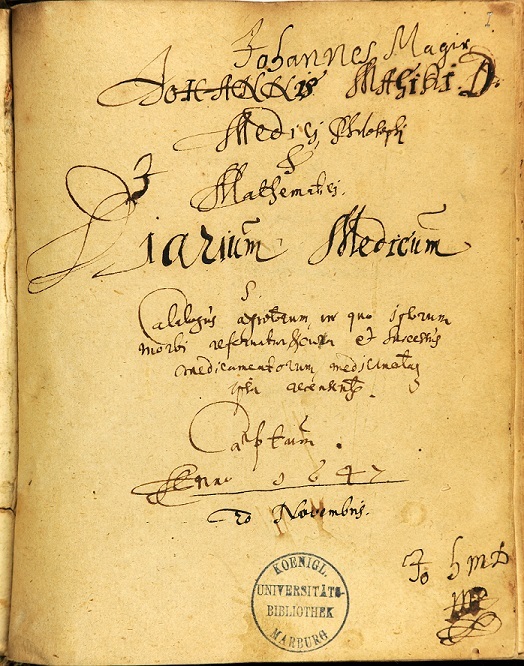 Often there are notes like ‘this is the powder I also have prescribed to the tailor in the roßstrasse’ that show how Magirus drew connections between different cases. He recorded successes as well as failures, and even tried to reduce side effects by singling out the one substance his patient showed an intolerance for, and then substituting it. if you use an ointment with mercury, it will cause convulsions, and the patients will get blisters in their throat, their uvula will fall off, they will develop ulcers, all teeth will beginn to loosen and get black, and a huge amount of stinking spittle will run out of their mouth. With less dangerous drugs, though, he experimented on himself and noted his personal experience. So we read that some aloe rosata ‘had dried up my stomach and I felt even worse than before’. When one of his colleagues prescribed a plum puree to one of his patients, Magirus took some of it to try it himself. 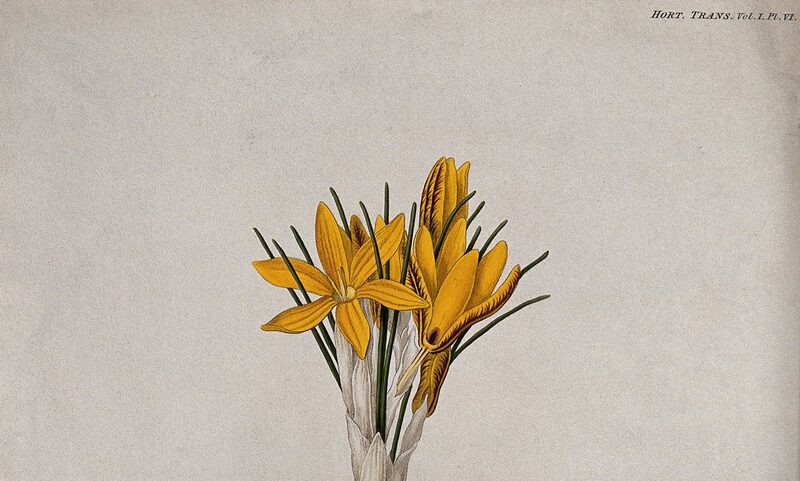 He didn’t like the effect very much, as he ‘felt a pain and rumble in my left hypochondrium’, and therefore came to the conclusion: ‘so it’s true: sugar and everything sweet are noxious for a spleen condition’. As unpleasant as this plum-related experience was for him, as rewarding was another: one of his patients, an advocat also named Johannes Magirus, obviously had told our Magirus how to prepare a formidable plum-juice with raisins, senis-leaves and fennel-seed that did wonders as a purge. Magirus must have tested this juice, as we can see that in the following time he began to prescribe it to his patients. I imagine Berlin at this time, i.e. just around the end of the Thirty-years-war, as a rather shabby place. Contemporary sources tell us that the elector was absent for most of the time and swine were roaming the mudden streets of the town outside the court-buildings. Magirus’ notes reveal that even the court-pharmacist was not able to provide some of the more sophisticated ingredients for his recipes. So it takes no wonder that something as simple as plums grew essential to his Berlin practice. This page from Anne Brumwich’s recipe book shows contributions by different authors, with different styles of handwriting. Anne Brumwich and Others, 1625–1700, MS 160. 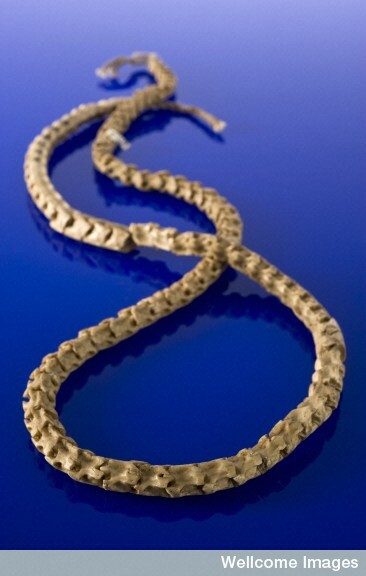 Image courtesy of the Wellcome Library, London. In my last post, I discussed how early modern advice books encouraged women to work together in kitchens. But did women follow these directions in their own homes? Kitchen accidents and mistakes of course caused tempers to fray. When Elizabeth Freke discovered that her servant had damaged a pot, she was so angry about it that she recorded it in her kitchen inventory, saying that the pot had been “brok out by Amey”! But you can also find proof of women’s attempts to foster positive relationships with each other. Even the recipes themselves show how women helped one another in the kitchen. Female authors wrote recipes from a communal perspective. Mary Bent’s recipe book featured instructions on how “to pickle cowcombers the best way,” and the author noted that “you may put a little pepper in if you please but we do not.” The use of the plural “we” here suggested that, for the recipe’s author, pickling cucumbers was a communal rather than a solitary activity. Women thus counted on one another for help in the kitchen, but they also used their recipes to advance female independence. Women’s recipes allowed them to share knowledge about acquiring materials and ingredients, navigating through urban spaces, and negotiating with shopkeepers. Many recipes encouraged women to purchase supplies in London, which had large numbers of apothecary shops. “M.B.’s” recipe of 1640 “to whiten the Teeth” called for “the stones of crabbs,” and readers were told that “you may buy [them] at the Redd Crosse in Cheap side a drugist.” An anonymous mid-seventeenth-century woman’s book recorded that “Vatican Pills” could be purchased from “the Apothecary . . . in the old Bayly in London.” Anne Brumwich’s book contained a recipe for a lotion that was said to prevent hair loss, and the ingredients for this lotion had to be purchased at “a Chymist a dutchmans in high holborn neare Grayes Inn field.” And Mary Chantrell’s book had a recipe for “an Excellent Coole pummatum [pomatum] for the face,” with ingredients that could be purchased “in See Lane in Holbourn.” From Gray’s Inn to Cheapside and from the Old Bailey to Holborn, early modern women used the information they gleaned from the recipe books of friends and relatives to traverse urban space. This knowledge was surely both useful and empowering. By furnishing women with information about reliable dealers, fair prices, and shop locations, handwritten recipe books allowed female recipe authors and their readers to share vital knowledge with one another and assert their independence in London’s streets and alleys. 1. 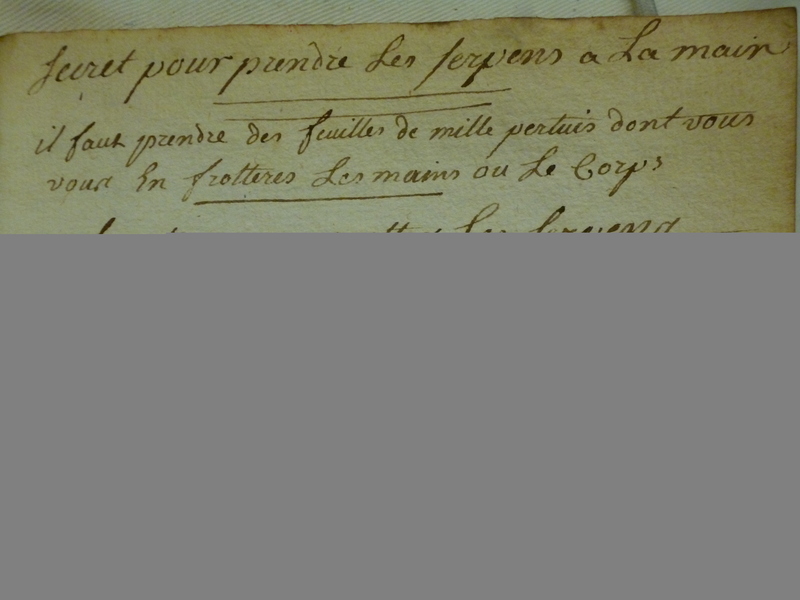 Elizabeth Freke, “Kitchen Inventory,” October 18, 1711, Freke Papers, MS 45718, British Library. 2. 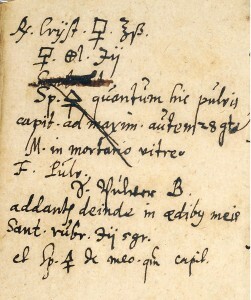 Jane Baber, Recipe Book, 1625, MS 108, f. 18, 22, Wellcome Library. 3. Anne Lany, Letter to Anne De Gray, c. 1670, Correspondence of the Family of Gawdy, ADD 36989, F540, British Library. 4. Beatrix Clerke, Letter to Lucy Hastings, Countess Huntingdon, 1665, Hastings Collection, Box 25 HA 1466, Huntington Library. 5. 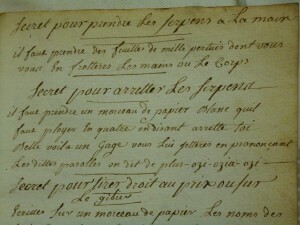 Mary Bent, Recipe Book, 1664, MS 1127, f. 2, Wellcome Library. 6. Anonymous Woman [Possibly Mrs. M. Baesh], Recipe Book, 1640, MS 8086, f. 14, 19, 35B, 54, 81, 94–94B, and 102, Wellcome Library. 7. 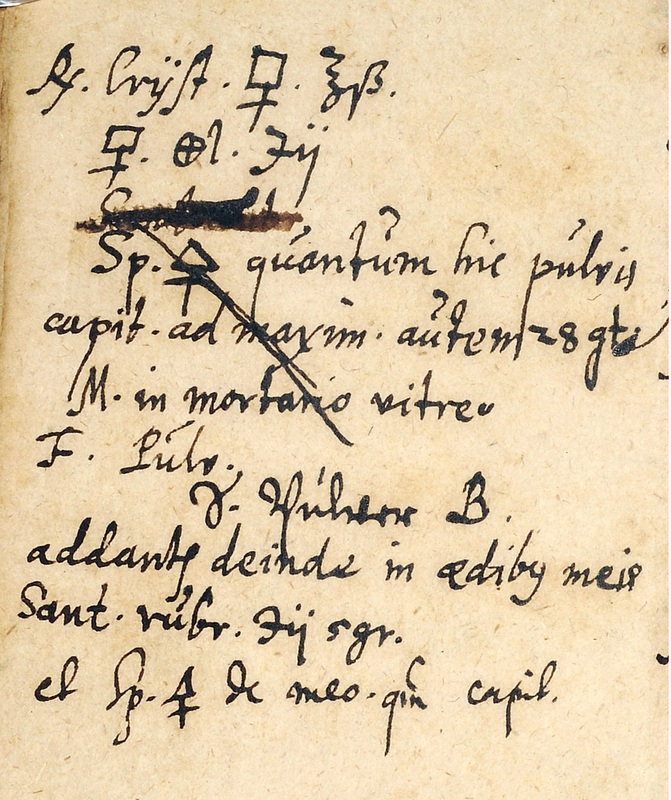 Anonymous, [possibly “EG”], Recipe Book, 17th c., MS 7391, Wellcome Library. 8. Anne Brumwich and Others, 1625–1700, MS 160, f. 94, Wellcome Library. 9. 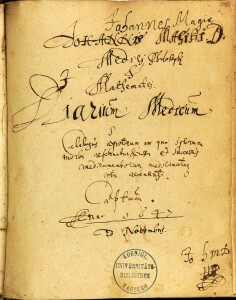 Mary Chantrell and Others, Recipe Book, 1690, MS 1548, f. 84, Wellcome Library. Too many cooks spoil the broth? Not in early modern England. We know that early modern women were charged with the feeding and care of their family and friends and that lower-status women were often employed in the domestic labor of cooking, brewing, dairying, baking, and gardening. More surprising is that women were expected to collaborate in the kitchen, undertaking these traditional tasks in groups. The expectation was that in any well-run household, domestic laborers (usually, but not always, women) would share their knowledge, time, labor, and kitchen-space – without grumbling, fighting, or competing! Such guidelines for behaviour can be found alongside cooking in prescriptive recipe books. If you spend time with early modern prescriptive literature and printed recipe books, you quickly learn to flip to the front first: elaborate frontispieces often decorate the inside covers of these works. Although recipe books were supposedly intended for elite readers, authors and publishers marketed their products in sophisticated ways. Prescriptive literature conveyed information through images as well as writing. The mix of text and print was supposed to appeal to many different kinds of consumers. Literate people could read the text, while partially-literate people could “read” the images in order to learn about the mechanics of domestic labor in elite homes. 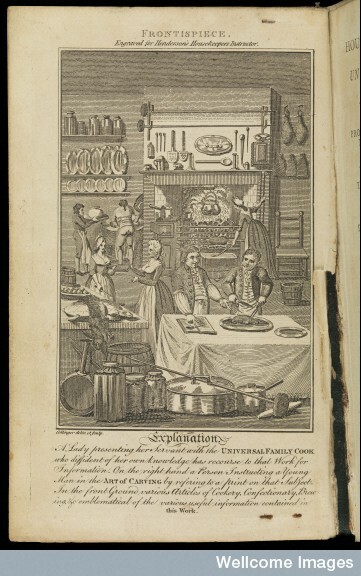 William Henderson, The Housekeeper’s Instructor; Or, The Universal Family Cook (c. 1790). Image credit: Wellcome Library, London. Men are also shown using recipe books. 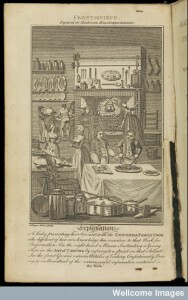 In the foreground of the frontispiece, two male kitchen workers carve a roasted fowl. The figure on the left points with one hand to an illustrated diagram in a book, which indicates how the meat is supposed to be cut, and with the other hand gestures toward the roast. The male figure on the right, who wields the knife, looks toward both the book and his companion for guidance. These men are not reading the text of the guidebook, but are instead examining its pictures in order to learn how to carve correctly. The kitchen in Universal Family Cook is an ideal cooking space, being calm, pleasant, and productive. It shows both high and low status people cooperating with one another in a friendly manner as they work towards a common goal. Friendliness, cheerfulness, and passivity were also qualities that were idealized in early modern women. A good woman, this image tells us, is like her kitchen: productive and cooperative, efficient and pleasant.